The current study examined whether individual differences in reactive and proactive aggression: 1) relate to level of daily emotion, including happiness, sadness, anger, and fear, 2) predict across-day variability in these emotions, and 3) moderate reactivity of these emotions to positive and negative events. Participants were a racially/ethnically diverse sample of 144 adolescents (80 girls, 64 boys; M age = 13.55 years; SD = 1.34). Adolescents self-reported on reactive and proactive aggression in a home visit prior to the collection of daily data. Using daily dairy procedures, adolescents then reported on their daily emotions and positive/negative events over 12 consecutive days. Higher reactive aggression was associated with greater levels of daily anger, more variability in anger across days, and heightened angry reactivity to negative events. Additionally, higher reactive aggression predicted lower levels of daily happiness but greater happy reactivity to positive events. Finally, higher reactive aggression was linked to increased variability in daily fear. In contrast, proactive aggression was largely unrelated to adolescents’ daily emotions, with the exception that higher proactive aggression predicted less variability in happiness across days. Results indicate that reactive aggression is characterized by significant emotionality at the daily level, and proactive aggression is characterized by lack of emotionality. This research was conducted with ethical approval by the University of Delaware Institutional Review Board. Parental informed consent and child assent were obtained for all participants included in the current study. Jambon, M., Colasante, T., Peplak, J., & Malti, T. (2018). Anger, sympathy, and children’s reactive and proactive aggression: Testing a differential correlate hypothesis. 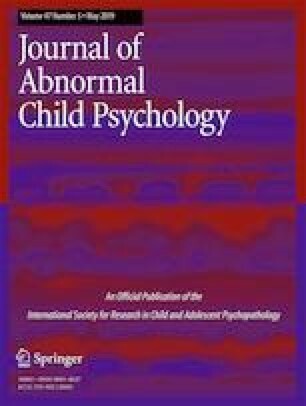 Journal of Abnormal Child Psychology. https://doi.org/10.1007/s10802-018-0498-3.